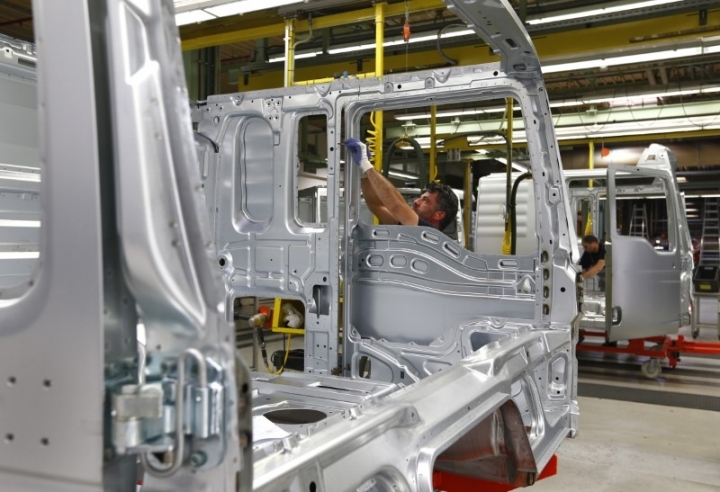 (Reuters) - Euro zone manufacturing growth accelerated to a six-year high in February as a weaker euro helped drive strong demand for its exports, with inflationary pressure showing further signs of recovering, a business survey showed. While the upturn in euro zone factory activity was not shared by all major economies, particularly France, prices rose faster across most countries in the region. The IHS Markit euro zone manufacturing Purchasing Managers' Index rose to 55.4 in February -- the highest reading since April 2011 -- from 55.2 in January, although it inched down from a flash estimate of 55.5. That reading is well above the 50 mark denoting growth and suggests a solid pickup in activity. Optimism among euro zone manufacturers about future business is also surging. An index measuring output, which feeds into a composite PMI due out on Friday, jumped to 57.3, which was also the highest in nearly six years. The flash composite PMI suggested economic growth of 0.6 percent in the first quarter. Separate data showed German unemployment fell more than expected in February, with the jobless rate holding at 5.9 percent, the lowest since German reunification in 1990. "Certainly if you look at euro zone manufacturing, it is the highest for quite some time, clearly suggesting the economy is gaining is little more traction compared to where we have been over the course of recent months," said Peter Dixon, economist at Commerzbank. "The other thing I would say is the strength of the sentiment indicator in recent months has probably outstripped the actual strength of the economy. So there are lots of positives -- but we have to be a little bit cautious." Renewed optimism about the region's economic outlook in recent weeks has been buoyed by a weak euro, which makes the currency bloc's exports relatively cheap on world markets. The latest PMI survey's new export orders sub-index rose to its highest since April 2011 at 55.5, up from 55.2 in January. "Euro area manufacturers are reporting the strongest production and order book growth for almost six years, in what's looking like an increasingly robust upturn," said Chris Williamson, chief business economist at IHS Markit. "This year has seen firms more optimistic about the future than at any time since the region's debt crisis. Companies are reporting stronger demand in both home and export markets, with the weakened euro providing an accompanying tailwind to help drive sales." Brisker exports and the fastest growth in prices charged in nearly six years will be welcome news for the European Central Bank, which is widely expected to remain on the sidelines through upcoming elections in key countries in the region. In Britain, manufacturing activity eased more than expected in February but still showed relatively solid expansion. It remains far from clear whether the latest upswing in euro zone activity will last, however. "You've got political risks which is clearly the one thing which should dominate the European economic agenda," said Dixon. But purchasing managers do not seem worried yet. "Given the current buoyant demand environment, manufacturers are eschewing political uncertainty and quietly getting on with growing their businesses," added IHS's Williamson.